Bring those old kites taking up room in your garage or closet to us in Cabarete! Our team of creative tailors will transform them into amazing stylish bags. 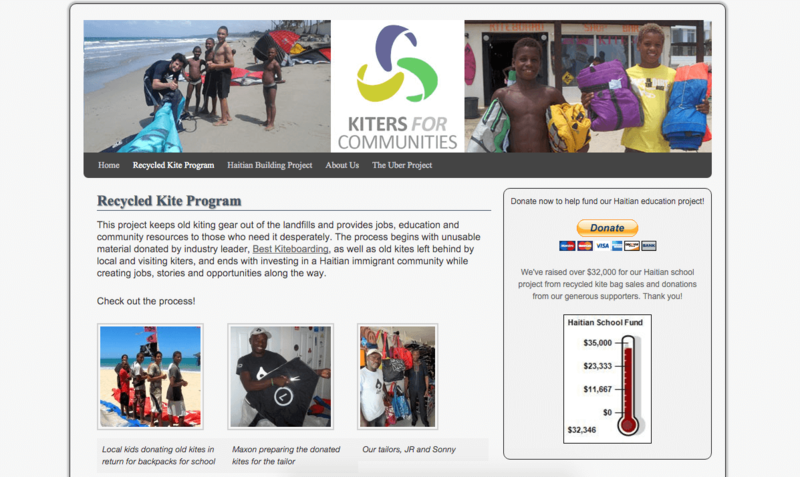 Kiters For Communities is a social business founded in 2010 by Laurel and Pete. Get your old kite to Cabarete. You can bring it with you or send it to our freight forwarder in Miami. Choose the bag style (messenger or beach). We’ll make you a free bag and use the rest of the material to build cute products and keep our team employed. The Kiters 4 Communities concept began in 2004 when Laurel started re-using old kites to make bags. In 2006, production moved to Dominican Republic where she began working with Soniel, a Haitian tailor. In the spring of 2010, Laurel traveled to Cape Haitian, Haiti for Soniel’s wedding. This area, untouched by the devastating earthquake, is extremely impoverished with few employment opportunities. Laurel was deeply affected by the situation, pushing her to consider what more could be done. Pete joined the “team” in the summer of 2010. Together they transformed the kite bag program into a social business.